Our ticket is closing tomorrow I believe, and I wanted to express my feelings to you before that happens. You and your program has changed our lives. In June, I had lost hope that Lilly would go on to have a “normal” life. Her oral eating had gone down to zero percent, and I felt I had lost my mind. I was deep in a state of depression and anxiety. I know that she was at her endpoint too. Something inside of her KNEW that feeding from a tube directly into her stomach was something that was not supposed to be happening anymore for her. She was in a constant state of retching and migraines and her body was just done accepting this way of living. I had been eyeing your netcoaching program for five years, but every time I felt that it was not possible to be weaned in this way. We had met every “expert” and not one person had been able to get her to make a transition to eating. I had read every book, read her every book on how wonderful food is, shown her every movie, bribed her in every way…One late night I was on the tube feeding awareness site on facebook and a woman recommended your program yet again. I KNEW at that moment that we had to do it. I called my mom and she immediately agreed that it had to be done, so she put it on her credit card without thinking twice. This was one of the BEST decisions I have ever made in my life. I was terrified during the wean. Every moment seemed to last hours. But the only other time I have witnessed such a miracle is when she was born alive. Within two weeks, she TAUGHT HERSELF how to eat. Her licking chips gave way to taking in spoons full of ice cream and marshmallow after chewy marshmallow. I began to see this child with cerebral palsy lift herself on gymnastics bars, run like she had never ran before, and speak with much more clarity. She has grown TO LOVE EATING. She not only sees it as something that needs to be done to make her feel good…she loves it! For lunch and dinner she only accepts macaroni and cheese, but for snacks and breakfast she is eating and drinking milk, oranges, apples, ice cream, popsicles, chips, smoothies, marshmallows, cheese, MEATBALLS, and a few other things I have forgotten! About a week ago, I felt this weight that I have been carrying on my chest for the last six years (since I was pregnant with Lilly), go away completely. I am ready for the rest of our lives to begin. I threw away her tubes and I told the formula delivery company that we don’t need formula EVER AGAIN!!!! Please know that I am going to talk to as many doctors and specialists as I can, in order to get the word out about your life-changing program. 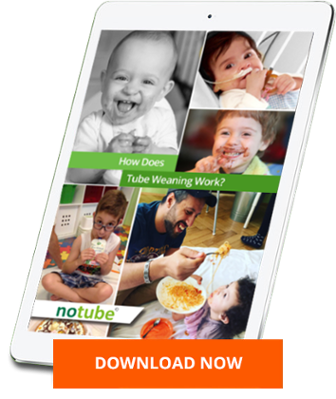 America needs to get on board with your ways and give tube-fed kids a chance at a life without a tube! They just aren’t giving kids the chance. It’s a real shame, and I intend to be a part of the change here. In December I will speak to a room of feeding specialists at Children’s Hospital regarding your program and I will do my best to show them that they need your help. I cannot thank you enough. I will always remember you with a fondness that I can’t accurately put into words. You have given us one of the biggest gifts of our lives. My mom and I have decided that we will all be going to Austria to meet your team in the future and to personally give you a hug. In time, Lilly will be told about her amazing achievement and she will carry this honor for the rest of her life. I will write you in January and let you know if we need help with adding variety for her and doing the LTE program. I will keep posting on your page on facebook. You’ve taught me to have faith and hope and to see the good.